Do you know why superheroes (like Superman, Batman, Spiderman, Wonder Woman, Supergirl, Batgirl, the list goes on and on...) always seem to wear knee-high boots? Well, first, it's because they look awesome. It's as simple as that. There's just something about them that really ties any superhero costume together. But secondly, and perhaps most importantly, it's because you can't deliver a roundhouse kick to the bad guys when you're wearing jogging shoes or high heels. Make no mistake: a superhero's footwear is a small but important part of their powers and abilities. 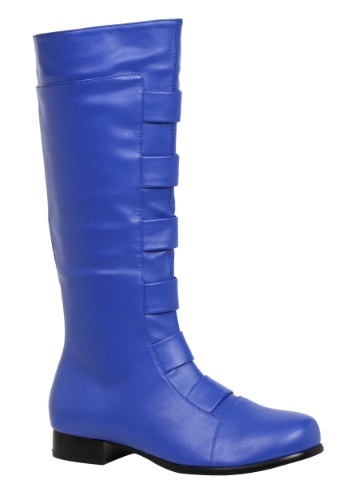 So before you head out on your first night as a crimefighter, make sure you've got these Adult Blue Superhero Boots! With a rich blue hue that looks like something right out of a comic book, there's no doubt they have the right look. But they've also got the right build. Decorative straps adorn the front and make them look like something you don't want to get kicked with, and there's a one inch heel for that added bit of lift. Because it's important to stand above all the imitators when you suit up as a superhero this Halloween!